The Blue Jays acquired LHP Thomas Pannone, along with IF Samad Taylor, from Cleveland in the trade for Joe Smith at the trade deadline. Here's a look at his minor league career so far, with a focus on his most recent start on July 29th. Pannone was a 33rd-round pick of the Cubs out Bishop Hendricken High (Warwick, R.I.) last year, but he didn't sign and made the cross-country trek to JC of Southern Nevada after initially committing to Miami. At 6-foot-2 and 185 pounds, he's a tightly wound athlete who was a two-way player in high school. He played more in the outfield for the Coyotes early in the year, and scouts said watching his pregame throws was a treat. He started getting more time on the mound midway through the season, and scouts see him in that role as a pro. Pannone was on the mound for Bishop Hendricken's state championship game last year, but as a two-way player from the Northeast he is still raw as a pitcher. His fastball sits in the 91-93 mph range, and he can spot it, but his secondary stuff is below-average. His curveball is ahead of his changeup. Scouts like his athleticism and bulldog mentality. (He has a) 89-92 fastball that he can spot pretty well. Fixed his mechanics this year a bit to stop from being so closed off. Helped him maintain some consistency in his velocity (was down to low 80s for a period last year). Breaking ball has come a long way this year and so has changeup. I think the curve is better than the change but some think the opposite. Change is 79-81. Good arm speed on change command just needs to improve. Over all he's a strike thrower who sits 89-92. If command keeps coming I think he could be a #4/5 guy consistently, at worst he's a depth starter/swingman with that potential. He took off after making some delivery adjustments last year, though his dominance is hard to explain. Pannone works with a 90-92 mph and can throw strikes with a decent curveball and changeup, and while his stuff isn't overwhelming, hitters just don't seem to see his fastball. Pannone started the second half of a doubleheader against the Orioles' AA affiliate on July 29th. He was a model of efficiency in a 13-pitch first inning, retiring the side in order with a swinging strike on an outside curve. In the 2nd, he was squared up twice with two outs, but retired the side. Throwing first pitch strikes, then using his change and curve to put hitters away or induce weak contact (Pannone also threw a four-seamer that was a tick or two higher than his usual low 90s velo to try to get swings and misses), he retired the side in order in the 3rd, 4th, 5th, and 6th. Into the 7th, Pannone had set down 14 hitters in a row before surrendering a one out single. The next hitter launched one over the centrefield wall to break the shutout, and bring an end to Pannone's night. How does Pannone get hitters out? By a solid combination of command of all three of his pitches (fastball, curve, change), and by sequencing. A tall-and-fall pitcher, Pannone has a bit of deception to his delivery, throws all three of his pitches from the same three-quarters arm slot, and consistently gets ahead of hitters, where his secondaries become more of a weapon. He can back door his curve to right-handed hitters, and throws his change in any count. He threw first pitch strikes to 16 of the 23 hitters he faced, opening each inning from the 3rd through to the 7th with a strike. Pannone can run his fastball up to 92-93 mph but usually sits more in the 88-91 mph range. Though not overpowering, Pannone's heater plays above its velocity on account of his deception, allowing him to induce whiffs inside the zone. He has good feel for his curveball, showing the ability to throw it for a strike and also bury it in the dirt when vying for whiffs, and he's adept at adding and subtracting with the pitch as needed. His changeup gives him a third average-or-better offering, albeit one he uses sparingly, and he has good command of all three pitches. Here is the thing about Pannone: despite the fact that he lacks a plus pitch in his arsenal, he gets hitters out. Will that translate to success in the major leagues? It's very hard to say - the relative lack of velo gives him less margin for error with his command and secondaries. But the guy appears to be pitching above his grades. Pannone is a competitor, who seems to have made the necessary adjustments to miss barrels and climb the minor league ladder. That may not translate to a top-of-the-rotation arm, but given his pitch economy, he could profile as a back-of-the-rotation innings-eater pitcher at the major league level. A mid-season Eastern League All Star, Pannone is among the league leaders in several pitching categories. He lacks the innings to qualify, but his 2.62 ERA is the second lowest in the league. His K% (24.5) is the highest, and his 11.8% swinging strike rate is the second highest. To this point, this is a guy who has pitched above his scouting grades. 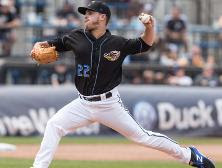 Pannone should report to New Hampshire and join their rotation, where he will join prospects Conner Greene, Sean Reid-Foley, and Jon Harris.